So excited to share with you all my most current blog post for Susquehanna Style! I am extra excited this month, because in addition to my monthly blog post I write for them, I wrote an article (like an actual, legit article for the magazine! Yay!) for their current issue on Pantone’s color of the year, Radiant Orchid! You can check out my article here! I had a blast writing it, and especially shopping around for all of the accessories for the photo shoot! With the change of seasons comes a change in my wardrobe. Yes, there are some items in my closet that I wear from season to season, whether it be adding opaque tights and a cardigan rather than sandals and a denim jacket, but there are also pieces that with the turn of a season I say see ya later to. Just like you clean out your pantry from time to time, you have got to clean out your closet. There is no reason you need to hold on to that one sweater you wore one time to dinner with friends and think “oh but its too cute to get rid of, and I might wear it again sometime.” I am guilty of that sometimes. I understand it can be hard to let go, but I am telling you- once you do, and get your closet organized, you will feel so much better! 1. Divide and Conquer: Get a game plan ahead of time. If you try and tackle the whole closet at once, you will be more likely to get overwhelmed and give up halfway through, leaving a mess! For example, Saturday, go through shirts and pants, Sunday, the shoes, etc. 2. If you haven’t worn it in the last year, get rid of it. You can donate it, sell it, throw it away, just get rid of it. There is an exception though-anything with sentimental value. I won’t get rid of my wedding shoes. I haven’t worn them since my wedding day, but they hold sentimental value to me. Not sure when the last time was that you wore something? Take all of your hangers and place them the same direction. When you have worn an item, turn the hanger around the opposite way. When its time to clean out your closet, you will easily know what you have and have not worn! 3. Categorize your closet: I personally keep all of my pants together, sleeveless tops, long sleeve, sweaters, and so on. If everything has a place you will know exactly where to find something and won’t have to weed through your whole closet. Some of my facebook friends prefer to organize based on color as well. All items in the red color family are kept together, blue color family, etc. Decide what works best for you and stick with it. 4. Make items as visible as possible: Otherwise, it won’t get worn. Out of sight, out of mind. I typically try to use my dresser drawers for my basic tee shirts and tanks (that I typically wear under sweaters or use for layering), workout clothes and pajamas. All of my other items are in my closet either folded on shelving or on hangers so I can see it! 5. Closet organization items don’t have to cost a lot: I’m sure everyone would love a perfectly designed closet, but who has the money for that? I personally love the reusable hooks and towel bars. They are perfect for necklaces, scarves, hats, robes and pajamas! I have two towel bars to hang my scarves. That opened up a whole shelf where I now have folded sweaters. 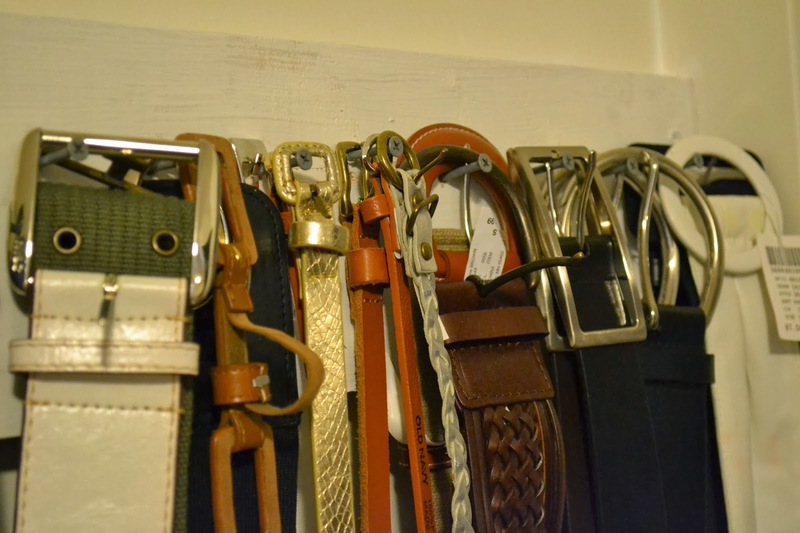 Homemade organization is also great- my father in law made a belt hook using a piece of wood and nails- nothing fancy or expensive, but it works a frees up shelf space! 6. Alternate your shoes. It allows for more room when storing them! I am able to squeeze one extra pair of shoes on each shelf because I alternate them! 7. Say yes to store hangers. You know when you are checking out and they ask you if you want the hanger? Say yes! I always do. I am fine with my hangers not matching. I love store hangers because they are big, sturdy and don’t leave weird bumps in the shoulders of your clothes. Plus I don’t have to spend extra money on hangers! 8. Have a clothing swap. I am sure a lot of your friends, coworkers, and their friends and coworkers all have clothes they want to get rid of. Host a clothing swap! Its a fun way to shop for free and spend some quality time with friends! 9. Maximize your space. If you have a small closet, think about over the door storage. Saves space and allows for more storage! (Shoes holders can be used to store other items like socks, tights, etc. 10. Utilize top to bottom. Use all the space in your closet, no matter how big or small. Similar to my last tip, maximize your space- add shelving above and below you hanging rods, double up your hanging rods in need be. If everything has a place, your closet, even with every space utilized from top to bottom, will not look cluttered. Get a game plan, find some great local organizations you can donate to, local consignment stores to sell you items, and get organizing! You will feel so much better when you are done! Check back here Friday for a small tour of my closet! Happy closet cleaning! 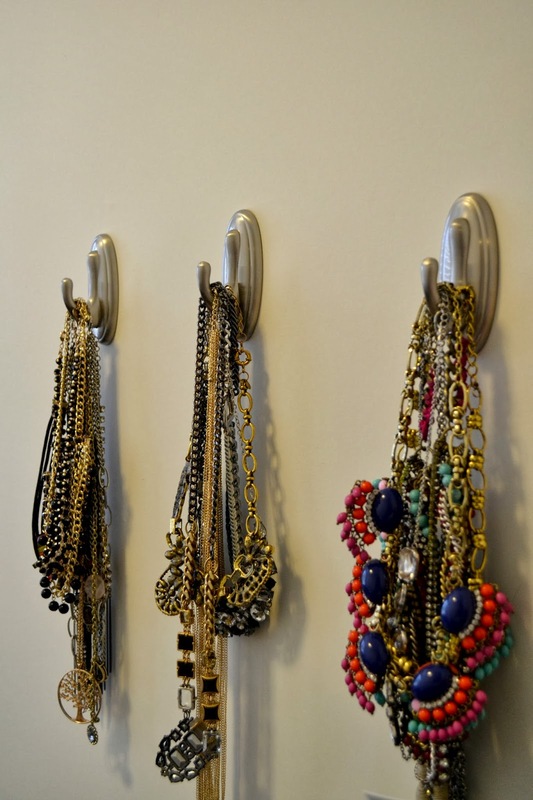 Great tips, especially the hangers and swaps! I've started saying Yes to store hangers and have realized I like them a lot! Thanks for sharing!